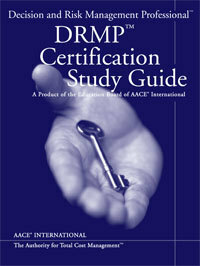 The AACE International Decision and Risk Management Professional (DRMP) Certification Study Guide aims to accomplish two purposes similar to that of the other AACE International Certification Study Guides. First, it is intended to aid aspiring candidates for the certification by summarizing the fields of study recommended for preparation for the certification examination. Second, the intent of the Decision and Risk Management Professional Certification Study Guide is to assemble and summarize various topics considered essential for the Decision and Risk Management Professional's (DRMP) knowledge, as outlined in AACE International's Recommended Practice 11R-88, "Required Skills and Knowledge of Cost Engineering", and 71R-12, "Required Skills and Knowledge of Decision and Risk Management".